What is Cosopt (Timolol Maleate/Dorzolamide HCL) used for? 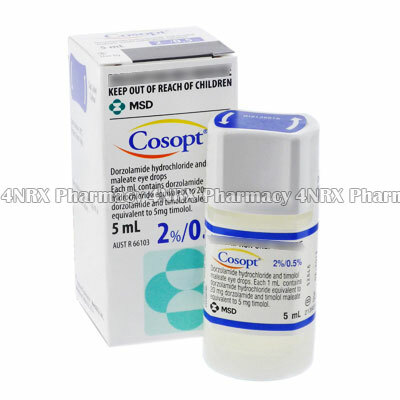 Cosopt (Timolol Maleate/Dorzolamide HCL) is an ophthalmic medication used to treat patients suffering from open angle glaucoma or pesudoexfoliative glaucoma. The medication reduces the pressure of fluid within the eye to prevent symptoms such as pain, loss of vision, or potential damage to the optic nerve. Your doctor may also prescribe its use for the treatment of other unlisted conditions. How should I use Cosopt (Timolol Maleate/Dorzolamide HCL)? Cosopt (Timolol Maleate/Dorzolamide HCL) should always be used according to your doctor`s instructions to get the safest and most effective results from treatment. Two daily doses are normally administered, but your particular directions will depend on your age, weight, health condition, and the severity of your symptoms. These should be administered by gently shaking the bottle to mix its contents, tilting your head back slightly, pulling down the lower lid of the eye being treated, and dispensing one drop into the eye. Slowly close the eyelid to spread the medication and keep it closed for thirty seconds allowing it to be absorbed. Do not allow the tip of the bottle to contact any foreign surfaces, including the eye itself, as this may lead to contamination. Always observe the medication prior to use to ensure it is not cloudy or discoloured as this may indicate contamination. What are the side effects of Cosopt (Timolol Maleate/Dorzolamide HCL)? Serious side effects that may require emergency medical attention are swelling of the eyelids, intense eye pain, irregular heartbeats, trouble breathing, depression, hallucinations, crusting, or drainage from the eye. Inform your doctor as soon as you experience any serious side effects to make sure the correct changes are made to your dosage or application frequency to prevent further health complications from occurring. Cosopt (Timolol Maleate/Dorzolamide HCL) should not be used to treat patients who are allergic to beta-blockers, who have had a bad reaction to similar treatments, or who have a history of asthma, chronic obstructive pulmonary disease (COPD), heart failure, 2nd or 3rd degree heart block, cardiogenic shock, hypotension, circulation problems, angina, or an untreated tumour affecting the adrenal gland. It is also recommended to inform your doctor if you have diabetes, hyperthyroidism, 1st degree heart block, psoriasis, myaesthenia gravis, sick sinus syndrome, a history of allergies, history of anaphylaxis, metabolic acidosis, or severe heart disease. These conditions may cause unexpected health problems requiring special adjustments to your regimen. Always remove your contact lenses before using the medication. Strictly use Cosopt (Timolol Maleate/Dorzolamide HCL) as prescribed and follow all instructions provided by your doctor. Safe, suitable, and optimum dosage can vary and is dependent on the patient`s health and medical history, as well as the condition you are treating. Cosopt (Timolol Maleate/Dorzolamide HCL) may not be safe or suitable for all patients. Always ensure your doctor is informed if you are pregnant or breastfeeding, using any other type of medication (including non-prescription medicine, vitamins, and supplements), as well as if you have any allergies, other illnesses, or pre-existing medication conditions.